City Councilman Mark Levine announced that city agencies would make sure the flood does not freeze over. UPPER WEST SIDE, NY — A Thursday morning water main break flooded a stretch of Broadway on the Upper West Side during the coldest day of the year. 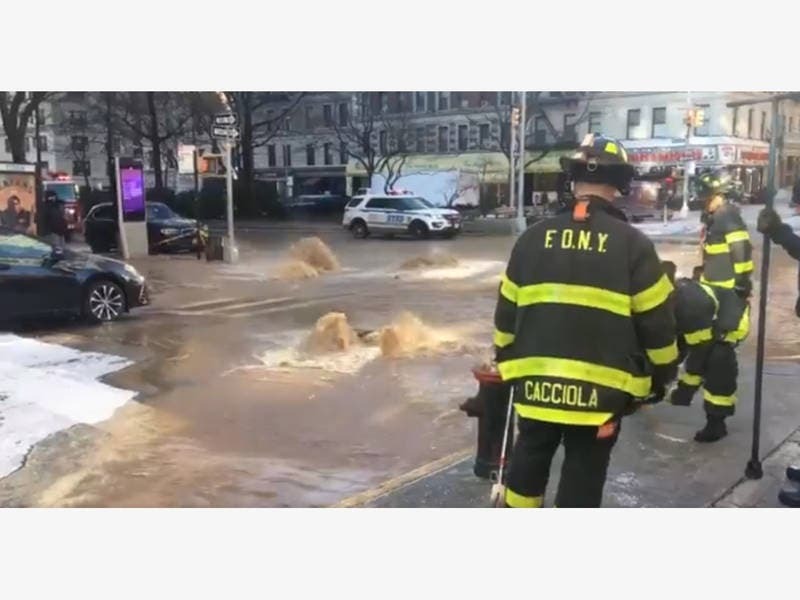 A water pipe near Broadway and West 99th Street broke shortly after 9:15 a.m., shooting streams of brown water through the pavement and forcing responders to shut down traffic on Broadway, according to witness video from the scene and fire officials. Firefighters and the city Department of Environmental Protection worked to shut water off at the site of the flooding. The water was shut down around 10:30 a.m., leaving a number of buildings on Broadway and West 99th Street without service, City Councilman Mark Levine said.